How much pain can a child bear?! Filipek has no more time! Filipek came to this world with bilateral fibular hemimelia, a defect that happens once in half a million births. His legs are deformed, there are no ankles, no fibulas, shin bones are bent 90 degrees to the back and significantly shortened, there are only two toes in the left foot and three in the right one… Filip does not stand or walk, he moves on all fours as if he was a dog… He has never even had shoes on his feet because none fit them; even in freezing temperatures we can only put socks on. I carry him in my arms everywhere. The worst thing is that he can already see that he is disabled. He still tries to stand up but always falls down; his entire body is in bruises… He is despairing and calling me: mum, hold my back, I want to walk... My heart breaks then. Every time. Everything was ready. We have been in the hospital for 4 days; Filip was fasting in preparation for the surgery… He was isolated from everyone earlier so that he would not catch any infection. We have not been leaving home at all for 6 weeks. The doctor was already on the plane to Poland, the anaesthesiologist was waiting… A nurse came to us a few hours before the surgery and said that there was a child with varicella in the ward. 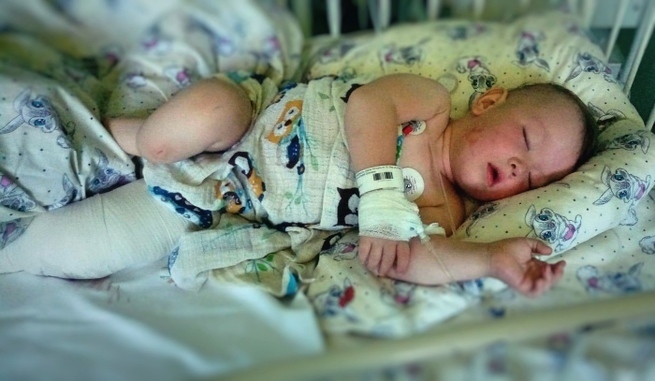 That child was not isolated and could infect other children, including Filip… Because of that, there could be no surgery… I cried all night and could not function without sedatives. I have a heart disease – on that day, I thought that my heart would stop beating because of the stress... 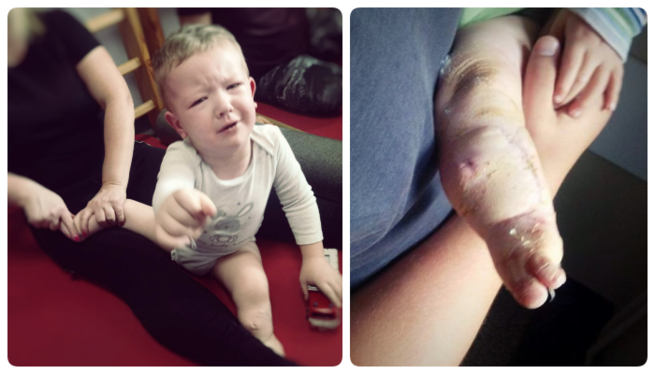 I was so desperate that I agreed for Polish doctors to operate my son one month later. I was afraid of their lack of experience, afraid that they would practice on Filipek. And it turned out that I was right. June 2017 – left leg surgery. It lasted 5 hours instead of 2, Filipek needed a blood transfusion and there was a problem with keeping him asleep. He was inhumanly screaming with pain despite the catheters through which anaesthetics were administered intravenously. After 2 days, it turned out that rods in the leg slipped and the surgery had to be repeated! 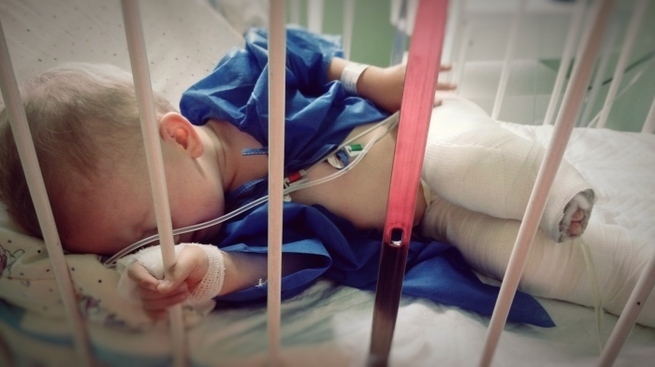 Inhuman pain repeated… Then, it was August and the surgery of the other leg. Months in casts interrupted only with tests and the taking of rods out of the legs with no anaesthetics! 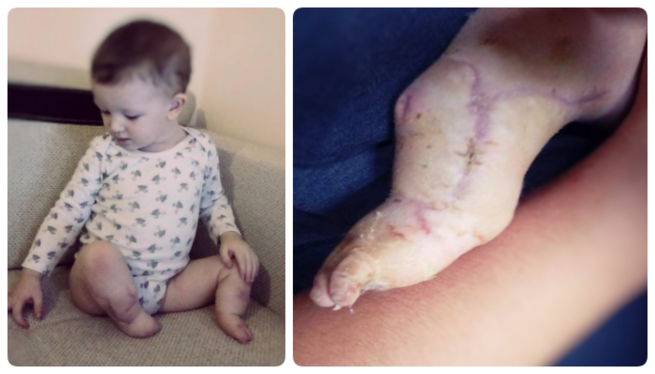 November – casts taken off… and zero difference in comparison with the condition from before the surgery except for large purple scars. I was told that time was necessary so I waited, rehabilitated but nothing changed. Now, I know that the surgeries failed and my son suffered in vain. He is 3 years old and still unable to stand on his feet; they are so crippled that even braces do not fit him! Our family begged doctor Paley to take care of our Filipek. He still wants to treat our son even though he was shocked to see the effects of surgeries carried out so far. He has to repair what was broken and operate my son’s legs again. 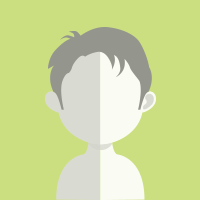 Moved by our story, he minimized the costs of treatment. It is the proof of how serious Filipek's condition is! However, the surgery has to take place as soon as possible; if we do not appear in the clinic in May we can lose our chance forever and Filip will remain a cripple moving on all fours.